Where is Homecrest furniture made? Since 1953, Homecrest Outdoor Living furniture has been made in Wadena, Minnesota. Where can I purchase Homecrest furniture? Click Here to locate a dealer near you. Can I buy direct from Homecrest Outdoor Living? In order to ensure you receive the best service and can see our products up close, Homecrest relies on a network of authorized dealers. Click Here to locate a dealer near you. Can I get replacement parts for my furniture? Yes. Click Here to locate a Homecrest Outdoor Living dealer near you or Click Here to shop replacements online. Where can I get replacement slings/cushions for my furniture? You can Click Here to locate a Homecrest Outdoor Living dealer near you or Click Here to shop replacements online. How do I care for my Homecrest Outdoor Living furniture? Click here to visit the “Use and Care” section of our website. Where can I see the fabrics and finishes you offer? To see samples online, visit the "Fabrics" section of our website. Visit an authorized dealer near you to see the finishes and fabric samples up close. How can I get a Homecrest Outdoor Living catalog? Click Here to view or download the most recent brochure and catalog. What is the warranty on Homecrest furniture? Click Here to view the residential warranty. What is the best method of cleaning my furniture? Click here to visit the "Use and Care" section of our website. What is a Sensation fabric? 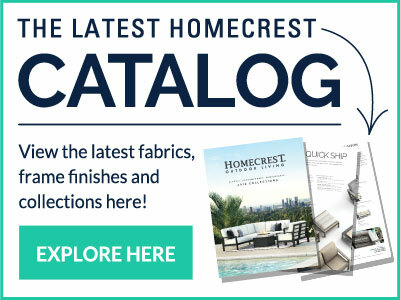 Sensation fabrics, offered exclusively by Homecrest Outdoor Living, are unique in the outdoor furniture industry. They combine the strength and UV-stability of PVC fibers with the comfort and outstanding memory of elastomeric yarns. Combine this with our proprietary double layer, ergonomically contoured sling technology, and you get arguably the most comfortable outdoor sling chair on the market backed by an industry- leading five-year sling warranty. Click here to view our Sensation fabric offering. Can I use a Sensation sling fabric as a replacement fabric option? How to I install a replacement sling with a Sensation sling fabric? All of Homecrest’s sling furniture uses internal support rails to shape and stretch the sling. This allows the sling to ergonomically conform to the body and eliminates a rigid surface. These internal support rails also serve as a guideline when replacing your sling. In order to install your replacement sling, the internal support rails will need to be detached from the frame with the use of special tools. While sensation replacement slings can be replaced in the same manner as any other replacement sling; the deluxe sling tool may be more helpful in the replacement process. When you are ready to replace your sling with the deluxe sling tool, simply follow these instructions. However, if you are using the regular sling tool, which comes with the replacement, these instructions will be more useful. Click here to download instructions or watch a video on how to replace a sling. A welt (W) is a trim that goes on the outside of the sling and is attached with a third sewn line to combine multiple layers of fabric. Homecrest's industry-leading slings and padded slings are constructed using a sewn-on welt. Welting can be selected to contrast or blend with the sling color selected. It is important to note that when you are custom ordering a sling or padded sling seating collection that have welting, you may select a welting color to coordinate with your fabric or, if no welt fabric is selected, the welt fabric will default to match the frame finish. Welt fabrics can also be used as slings and backing for padded slings. Click here to view our welt fabric offering. How do I know which fabrics are welts? When shopping in a store, welt fabrics are identified with a "W" symbol on the swatch label. When looking online or in a Homecrest catalog, welt fabrics are located under the "Welting Fabrics" category within the fabrics section. Click here to view our welt fabric offering. There is really no quality difference between Grade A and Grade B sling fabrics. Instead, the distinction is based on the cost of raw material. Factors that affect the price include thread color, stocking status and order quantities. Grade differences are for the most part price related; the higher the grade the higher the fabric price. How do I determine what kind of replacement sling I need? The Catalog Archive, found at homecrest.com/catalog-archive, is an invaluable tool for identifying replacements for resilient Homecrest outdoor patio furniture by allowing you to look through past catalogs. With the model number identified, use the Model Identification Guide to direct you to the replacement number needed. refer to the “Replacement #” column to find the replacement number you need to use when placing an order. Note: Replacement arm and floor glides are also listed. Products manufactured after 1998 have a manufacturing decal, which is located on the product’s metal frame. On the manufacturing decal, there is a set of digits. The first two digits indicate the week of the year the product was produced, the next set of digits represent the product’s model number and the last two digits are the year the product was produced. With the model number identified, use the Model Identification Guide to direct you to the replacement number needed. What if I can't find my replacement sling using the tools Homecrest has suggested? Most replacement baskets are low back and high back sling chairs that Homecrest has produced over the years. These chairs utilize four different replacement slings. Here is a quick way to identify replacements needed for these four types of chairs. If you don’t know the model number by searching the Catalog Archive, Model Identification Guide or manufacturing decal, you will need to do a few visual identifications. The first characteristic is the style of cross bar. External cross bars will be visible at the top or in the top third of the chair back, whereas the internal cross bar will not be visible. The next characteristic to look for is the style of back. High back sling baskets will measure 29” to 32” while low back baskets measure 23” to 25”. When measuring your basket, start from the curve (in the back) to the top of the chair. After identifying the type of replacement sling you need, reference swatch labels or the fabric index in both the catalog and price list to identify fabrics that are available for your type of replacement. If you are still in need of some help, you can visit a retailer with a picture of your set, along with a few measurements, or you can connect with us online to help you determine what you need. Purchase replacements for all your existing Homecrest furniture here. Join our online community and get all the latest news and product updates from Homecrest Outdoor Living.